a) Promote light penetration into the trees thus keeping the shoots alive. b) Maintain the frame work hence training for size and shape for effective light utilization, air movement and manage tree height. c) Maintain size and shape for optimal tree and orchard management eg, tractors can move within the orchard with ease. d) Encourage regular shoot and branch renewal, rejuvenating growth ensuring availability of new wood for fruiting. e) Obtain tree complexity for maximum bearing units thus maximizing production. f) Open up the trees hence reduce instances of fungal disease spread hence reduce instances of fungal diseases, e.g. Cercosfora. h) Reducing plant tree vigor in water shoot removal. • Training starts in tree seedlings whilst in the nursery. This entails selection of the strongest upright growing branch as a leader. There is also removal of any other strong branch developing on the tree to curb competition for energy and nutrients. • Furthermore, horizontal side branches are spread evenly along the main stem to ensure that a strong frame, balanced framework will develop. • During the rest of the growing season, removal of water shoots has to be done continuously while the horizontal growing branches are tipped sparingly to stimulate side shoot development hence achieve branch complexity. • As a guideline any branch thicker than half the thickness of the leader is removed whereas any branch thicker than a third the thickness of the leader is pruned back severely to control its vigor. a) Selection and developing of the leader. b) Removal of leader competition. d) Developing a well-balanced branching system (framework). a) Water shoot and unwanted shoot removal. b) Shoot and branch thinning for light penetration. c) Besides these operations, shoots developing too close together are thinned. From the 3rd year onwards, this regular and timed pruning continues to enhance the shape of the plant. 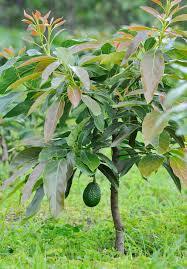 Its preferred as the best shape for avocado optimum crop production. To curb massive loss in production after pruning for shape achievement, one side of the tree rows running is pruned singly in a season after which the other part is pruned in the following season. Concurrently, branch renewal is done after harvest to maintain branch vigor for good production. This is done by pruning back the branch to a new developing branch inside the tree. Should be maintained at 70% of the work row width to ensure adequate light interception into the rows onto the lower parts of the adjacent rows thus curbing the would-be shading effect if the trees were to be left to increase excessively in height. Remains a continuous operation in the tree management. • Pruning is a tool that is used to rehabilitate older trees. Trees older than 12 years are usually very high and equally wide. 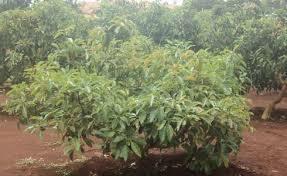 • This makes irrigation, spraying, picking, fertilizers application and general orchard management cumbersome. Production declines as well as fruit size and quality. • Heavily encroached orchards require a 3-year pruning programme to reduce the tree size and open up the orchard. Overhanging branches are removed completely to ensure that sunlight reaches into the tree up to the base. Any upward growing branches on the outer edge of the tree are removed. This diminish energy reserves by producing wood rather than fruit. • Height control up to 70% of the work row tree then starts in the 2nd year. Shaping of the tree to achieve pyramid shape also starts. Continuous water shoot removal also continues. Maintenance pruning then continues from here. hello Paul get quality and reliable seedlings from us contact 0723662773 to get assistance.